As expected, the parole of the man who killed Serena Williams' sister led to the most lopsided loss of Williams' career on July 31. 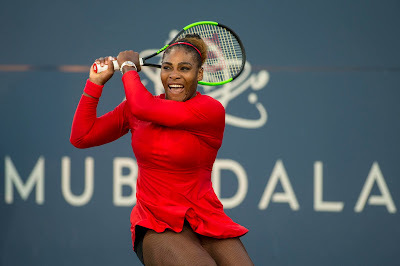 Williams told Time that she learned of Robert E. Maxfield's parole about 10 minutes before her first-round match in the Mubadala Silicon Valley Classic in San Jose. "I couldn't shake it out of my mind," Williams said. After losing to Johanna Konta of Great Britain 6-1, 6-0 in 51 minutes, Williams told reporters: "She played better in this match than she has in about 18 months, so that's great for her. I know I can play a zillion times better, but I have so many things on my mind, I don't have time to be shocked about a loss that clearly wasn't when I was at my best. I can only try to be there and fight, which is what I was doing out there. I moved a lot better, too, so I'll take the positives where I can." Maxfield was convicted of fatally shooting Yetunde Price, a 31-year-old mother of three, in 2003 and paroled three years short of his full sentence earlier this year, ESPN and The Associated Press reported. Williams said she received the news of the parole while checking Instagram on her phone before the match. "It was hard because all I think about is her kids," Williams told Time, "and what they meant to me. And how much I love them. "No matter what, my sister is not coming back for good behavior. It's unfair that she'll never have an opportunity to hug me." Williams added that she wants to forgive but can't yet. Williams lives in San Francisco with her husband, Reddit co-founder Alexis Ohanian, and their daughter Olympia, who will turn 1 on Sept. 1. Reddit is a social news aggregation, web content rating and discussion website.